We'd love to hear about your success!
" It was hard at first..but after almost three years I have to say with cutting out certain foods and taking the supplements recommended, I am Now from 69% med to high to 39% which is low! If you want a healthy life you really do need to listen to Dr Marc! " "For three weeks now, I have been pain free for the first time in over 14 years. I have truly turned the corner to a healthier body, a stronger body and a very happy, thankful person. I now can enjoy picking up and holding my grandchildren." "It has been 33 months since you said that your body could heal. The medical doctors here said that there was nothing more that they could do for me because I refused to take their prescription drugs. I refused them because I was allergic to them and they wanted me to increase steroid use to mask the side effects I was suffering. I went to medical doctors for the pain in my fingers and they told me I had rheumatoid arthritis. After 30 years of prescription drugs and gold shots to help me live with rheumatoid arthritis, I also developed osteoporosis, Sjorgen’s disease, and high blood pressure, all side-effects from the drugs. I was in pretty bad shape when my daughter introduced me to you. I was in so much pain from my top of my head to my toes. My body was not digesting food so I was very weak and had lost a lot of weight. My blood pressure was high, my bones brittle and my adrenal glands were not working, just to list a few of the side effects from prescription drugs. It took a lot of work, faith, and perseverance, but you were there for me all the way and for this I want to say THANK YOU. For three weeks now, I have been pain free for the first time in over 14 years. I have truly turned the corner to a healthier body, a stronger body and a very happy, thankful person. I now can enjoy picking up and holding my grandchildren. I look forward to seeing you next month so you can see how well I am finally doing. What people need to know is I drove from Michigan every month for 24 months straight to see you (plus, my 4 beautiful grandchildren, daughter and son-in-law). I wish you could train some of the doctors here in Michigan in NRT! "Now my face is much clearer and I feel so much better about myself because I look and feel healthy. That is a wonderful feeling! Every sacrifice of sugar, etc., is totally worth it because it’s handled things for me that I had given up on. It really does work!" “I have had too many successes coming to Dr. D’Andrea. We started a nutritional program over a year ago – no dairy, no sugar, then only unsweetened tea, then only 24 ounces of tea a day – you name it and I have done it. It has been worth every sacrifice and every discipline. ? ?I have very little attention on how my body feels because it is just operating well. It’s not sick, not sore, not tired. It just is working the way it is supposed to. When I started my face was very broken out and had been since I was a teenager (I’m now 23). It didn’t seem right to me that it would still be that broken out at my age. After coming here I found out that it was because of outnesses with my body. It felt so great to know that there was something I could do about it (nothing had helped it before). Now my face is much clearer and I feel so much better about myself because I look and feel healthy. That is a wonderful feeling! Every sacrifice of sugar, etc., is totally worth it because it’s handled things for me that I had given up on. It really does work! !” A.R. "I feel happy and energetic. My dry skin is gone! I have no digestive problems or vertigo. I would recommend this procedure to everyone!" “Wow! I feel great. Two weeks ago I did the Natural Allergy procedure for chicken and egg protein. Within 30 seconds of holding the protein I began to experience vertigo which I had suffered from before along with various other symptoms. Now it doesn’t affect me anymore.? I feel happy and energetic. My dry skin is gone! I have no digestive problems or vertigo. I would recommend this procedure to everyone! Thanks Dr. Marc & staff.”- A.R. "I am back to my normal life"
“Dr Marc, I did not sleep well the last three weeks because of my asthma, but after my visit to Dr. Marc ,1) I am able to work normally 2) I sleep like a baby (I am 39) 3) I’m able to play volleyball again. Conclusion: I am back to my normal life.”- J.M. "it is unbelievable the progress he has made"
"Dr. Marc has saved me from many possible back surgeries, seen me through foot problems, stomach ulcers, sinus infections, numerous colds and flu, and menopause symptoms"
“I remember sitting in the Neurosurgeon’s office, my post-op follow-up, listening to people talk about their 2nd and 3rd back surgeries. I was just recovering from my first and listening to those people was very discouraging to me. I did not want to go through that again!! That was in 1977.Ten years later, I found myself in terrible back pain, not knowing what to do. I was scared but determined not to go have back surgery again. What was I going to do? Where would I go? I had heard of Chiropractors, but that really scared me!! The more I thought about it the more I realized that that was my only choice, either try a Chiropractor or possibly have surgery again. My Success Story involves 15 years of Successes, thanks to Dr. Marc and Jeanne (I have to include Jeanne in my success story for many reasons, but the most important reason is, I believe, if Dr. Marc did not have a supportive wife in his practice, a caring, knowledgeable wife in his practice, people would not have the successes they do. So “thanks” Jeanne, you are great too!!!Dr. Marc has saved me from many possible back surgeries, seen me through foot problems, stomach ulcers, sinus infections, numerous colds and flu, and menopause symptoms. Jeanne has taught me about food—how to eat, what to eat. I’ve learned that God created our bodies to heal on their own – garbage in, garbage out. Dr. Marc has helped my husband through many back problems, knee problems – with his asthma and with his prostate. Most importantly, Dr. Marc has helped me get my life back after a terrible bout with depression, which led to a drug addiction. You might ask me, “Why would you get hooked on drugs?” I believe in God and the scriptures and in Jeremiah 29:11 God tells us, “For I know the plans I have for you, declares the Lord, plans for welfare and not calamity, to give you a future and a hope.” This is the ONLY ANSWER I have for that question. But, the good news is, through chiropractic care and CRA – because of much prayer from loved ones and an unconditional love that was shown to me from Dr. Marc and Jeanne, I am alive today — drug free. I was telling one of my friends the other day about Dr. Marc, and they asked me to describe him and these are the words that came to my mind: compassionate, loving, understanding, sensitive, caring, personable, efficient, patient, effective, real, honest, reliable, humble, accommodating, down to earth, flexible, intelligent, patient oriented, and the very best word to describe Dr. Marc is “friend”. Now, can you describe your doctor with these words? How about using just half of there words? This man truly cares about your health and well-being. God has blessed Dr. Marc with the incredible gift of healing and caring.” C.C. "I can’t thank Dr. Marc and his staff enough for giving me not only a renewed hope, but REAL RESULTS"
“If you can imagine what it’s like to awaken every morning in pain, then you have some idea of what my life has been like for the last three years. I am only 46, but I felt, and I walked like I was 90+ for at least the first few hours of each day. Every joint in my body ached. My head always felt heavy, and foggy. Some days were better than others, but this never went away. And even when I managed to “ignore” it and get going, I would have so little energy that by the end of the day, I just wanted to collapse. Various doctors and dentists who have treated me for acute problems over the last few years have not had an answer for the above. Some recommended ‘treatments’ that actually made me feel worse. Some told me that it was ‘all in my head’. Some said ‘that’s what happens when you’re over 40’. So, I wasn’t totally enthusiastic about coming to see Dr. Marc. I had almost accepted the idea that it WAS all in my head. And I’d been disappointed so many times in the past when I tried to find an answer, that I didn’t want another disappointment. Well, I wasn’t disappointed. In fact, I am amazed. The accuracy of the CRA is incredible, and it was a tremendous relief to learn that not only is it NOT ‘all in my head’, but that something could be done about it! Then, I did “allergen clearing”, which was totally new to me. Immediately afterwards, I literally felt as though a huge weight lifted off my body. Sounds strange, and I felt rather strange and a little tired for several hours afterward. But when I woke up this morning, I was already down the stairs before I realized that I didn’t hurt. I wasn’t limping. My head didn’t feel foggy. My body feels lighter, and more limber. And while this is just the first step of the program to get my life back, it is such a huge leap from where I was that I am very excited about the next step. I can’t thank Dr. Marc and his staff enough for giving me not only a renewed hope, but REAL RESULTS.” G.M. "After meeting with you Dr. Marc and discussing the X-rays, you went to work and with a twist of my head and a pull of my fingers and lots of good nutrition and advise, I was within weeks, pain free"
“Thank you Dr. Marc for giving me my life and health back. Being a hairdresser and self-supporting and having Carpal Tunnel Syndrome, I walked 3 years in pain almost every night up and down the bedroom or hallway. The medical Dr.’s did all tests and said either quit your job or get an operation. Neither one was acceptable to me. Upon calling your office, Jeanne said we make X-rays and tell you if we can help or not. After meeting with you Dr. Marc and discussing the X-rays, you went to work and with a twist of my head and a pull of my fingers and lots of good nutrition and advise, I was within weeks, pain free. I am forever grateful to you Dr. Marc—to you and your family. I am in awe of your dedication to help and heal others. May God grant you many, many more years in the healing profession. ? ?It’s now a year later and I continue to be pain free. My hands feel so good I try not to take it for granted. A “Thank You” is not enough.” H.N. "Dr. Marc has not only helped us to unlock the unlimited potential within Alexis but he has also taught us how to raise a healthy drug-free child. Family members, friends and teachers are amazed at the progress that Alexis has made since we started nutritional counseling and therapy with Dr. Marc"
“Our daughter was unable to open her mouth to eat. It was like her mouth was locked. In a panic, I took Alexis to her pediatrician. He had no idea why she couldn’t open her mouth to eat. I then took Alexis to a neurologist. He diagnosed Alexis with obsessive-compulsive disorder and prescribed Prozac. I held the prescription for 2 weeks because I didn’t believe that drugs were the answer to this problem. Reluctantly, I gave her the Prozac. After a couple of days, Alexis could open her mouth to eat but she was also sluggish and “out of sorts.” After a few months, she was unable to open her mouth to eat. The neurologist’s response was to increase the dosage of Prozac. At my wits end, one of my co-workers overheard me complaining and referred me to Dr. Marc. After our first visit with Dr. Marc, I stopped giving Alexis the Prozac and began her on nutritional supplements. After two weeks I noticed that Alexis was more attentive and more importantly, she could open her mouth to eat. Alexis has made so much progress since Dr. Marc began seeing her. Alexis was born extremely premature and is developmentally delayed. She was also diagnosed with cerebral palsy. When we met Dr. Marc, Alexis could not speak and she walked with a walker with minimal assistance, she is now beginning to vocalize and can say Hi, bye and papa (for daddy.) She has made significant progress developmentally and physically. She plays on the computer for hours at a time and stays on task at school. Dr. Marc has not only helped us to unlock the unlimited potential within Alexis but he has also taught us how to raise a healthy drug-free child. Family members, friends and teachers are amazed at the progress that Alexis has made since we started nutritional counseling and therapy with Dr. Marc. Thank you Dr. Marc for helping Alexis reach her potential through a healthy and drug-free nutritional program.”R. & A. D.
"My chronic illness has vanished"
“What is success? I could write about the years I searched the medical model to discover answers: Why did my immune system fail? What is this chronic disease? Lupus? Sarcoidosis? Polyarteritis? What can I do to manage this disease? Will I ever work again? Feel good again? Be free of pain? Or I could write about a lifelong pattern of ear infections, sinus infections, colds, bronchitis, and pneumonia—how every infection that now invades my body is mild, or stopped dead in its tracks—how pneumonia, now a rare occurrence, is milder than any cold I remember having as a child. I have been exclusively using nutritional evaluation for 8-9 years now, first with my practitioner in Washington State, for the last six years with Dr. Marc. My chronic illness has vanished. My predilection toward respiratory and sinus infection is gone. I have not taken antibiotics in 8 years, not when I was diagnosed with strep, pneumonia or anything else. But success for me is more than conquering a chronic immune system dysfunction, or a life-long pattern of reoccurring infection. For me the real success lies in understanding the cause of my immune dysfunction, the cause of disease, and learning how to help my body heal itself. Success is empowerment, knowing my body has the answers and the ability to heal itself when given the tools, knowing I am not powerless in the equation, but the master of the process. This, to me, is true success.” A.E. "My body feels strong and well"
“I recently finished a job with which I worked about 14 to 15 hours a day for 5 days. I have had jobs like this in the past and usually I would get sick when it was over. Now even though I am a bit tired my body feels strong and well. My wife and daughter are also doing quite well.” J.D. "It has been eight weeks and I feel 100% better!" “For the last year or so I have been experiencing depression, neck pain, lack of energy, dizziness, and I have been very emotional. My medical doctor put me on birth control pills. I took them for a while, but didn’t like the feeling they gave me. I took myself off of them, and the doctors wanted to put me on Prozac!! That was not something I wanted to take so I came to Dr. Marc. He checked me and found a nutritional problem. It has been eight weeks and I feel 100% better! I have more energy and my family (my daughter) says that I’m not so mean!” D.C.
"My eyes no longer have brown, aging circles around them. I look younger. My fingernails are strong and look pink and beautiful"
“Upon entering into treatment with Dr. D’Andrea, I was not even aware of how “worn-out” my body was! I have energy again. My eyes no longer have brown, aging circles around them. I look younger. My fingernails are strong and look pink and beautiful (I have NEVER been able to grow fingernails! )It is such a pleasure to say, “here is another problem area to work on” and to see results almost immediately. Most remarkable of all is my eyesight. I am extremely nearsighted and wear contacts to correct my vision. In the last year I have started wearing reading glasses – OVER THE COUNTER – for close work. Now my near sight is returning and my use of reading glasses is much less. I can’t wait for the other “miracles” of nutritional evaluation to come forth. It works and it’s fun.” D.E. 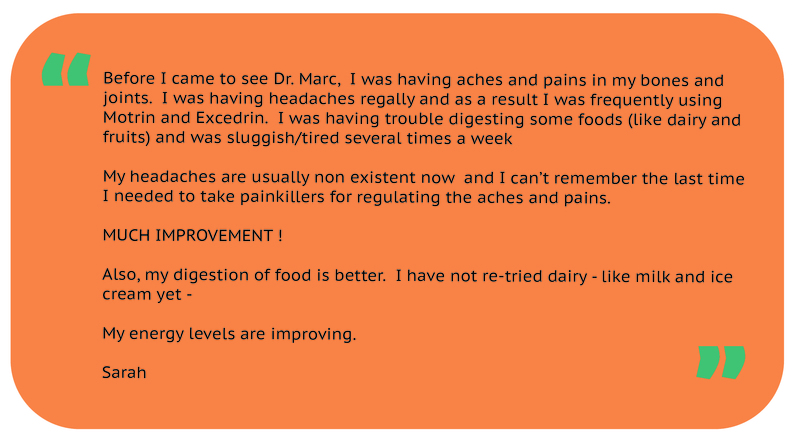 "My headaches were gone in two days"
“Dear Dr. Marc, I was having headaches every day for three months. I had CT scans and doctors were masking the pain with narcotics that inhibited my ability to work efficiently. A friend referred me to Dr. Marc and after an evaluation and addition of supplements, diet change and activity change… my headaches were gone in two days. I continue to see Dr. Marc on a regular basis to keep me healthy.” S.C.
"Amazingly, within two months my neck and joint pain had decreased significantly. " “I had been in constant pain over the last 5 years! All my joints ached with my neck in a constant and intense spasm. Often, I could not look left or right (without turning my whole body) or even look up because of the pain. I was tired, frustrated and irritable from dealing with all the pain everyday, all day long. I attributed this pain to numerous sports injuries I had sustained coupled with the aging process. Thus, I had more or less resigned myself to daily, chronic pain and fatigue. However, I was and am always reading about alternative approaches to health and looking for something to improve my situation. And, although Chiropractic has certainly given me relief over the years, I could not hold an adjustment for more than a few hours, so the pain returned quickly. About six months ago, Dr. D’Andrea began treating me using nutritional analysis. Amazingly, within two months my neck and joint pain had decreased significantly. Dr. D’Andrea used an analogy that the body is like and onion. And, as we fixed a layer, others with less prominent or less noticeable malfunctions have become more apparent. We’ve been working together to minimize the pain, fatigue, water retention, hair thinning and more. His nutritional evaluation process is working for me! And, I intend to continue with it. I am delighted that Dr. D’Andrea is stretching to find additional and alternative approaches to providing even better health care for his patients. Having seen a number of Chiropractors before Dr. D’Andrea, I have found that not all chiropractors are as caring or progressive as he is.For me, there is no doubt that a combination of chiropractic and nutrition are NATURAL keys to achieving and maintaining good health. As far as this onion goes, I am getting better. Yes, there are still some pains and yes, when I’m under a lot of stress, my neck and back spasm. But I have found hope and improvement with Dr. D’Andrea, chiropractic, and nutritional evaluation.I would recommend that you, too, get with the program. Let Dr. D’Andrea find the keys for a healthier you and begin to peel away your malfunctioning layers.” P.D.R. "Within 24 hours of coming to the office, I had no headache! I’ve not had a migraine since"
“Dear Dr. Marc, I began having severe migraines Dec. 9, 2005. Over the following 2 ½ months, I had a CAT scan, MRA, MRI. All tests revealed nothing. I saw a well-known neurologist in Atlanta known for migraine research. ?At the time I came to see Dr. Marc, I was desperate for a solution, missing work often and miserable. I was on five different prescription medications for prevention and pain with no success. Within 24 hours of coming to the office, I had no headache! I’ve not had a migraine since! I still have a lot to learn about my body, nutrition and lifestyle, but I’m on the right track.” M.W. "Dr. Marc immediately eliminated about 95% of my current diet and has challenged me to make other changes over the last 2 month. It has been a struggle, but the result is that I went for almost 4 weeks without a migraine!" “My problem is migraine headaches, which started over twelve years ago in 1989. My symptoms include throbbing, nauseous headaches that centered in the back of my neck just below my skull or in the area where the neck meets the shoulder. Sometimes the pain is centered in my jaw joint. The pain radiates over the entire sides of my head even into my eye. Over the years I have seen a number of doctors for this problem – 2 MD’s, 3 Neurologists, 1 Chiropractor, 1 Biofeedback Therapist, 1 Physical Therapist, 1TMJ Orthodontist, and 1 Masseuse. I have literally tried over 20 different medications to prevent or treat migraines. Only a few have worked at different times in the journey (Fiorinal, Imitres, and now Mazalt/Amerge). But these typically have some side effects with stomach distress and also they don’t always work. I have also tried biofeedback, TENS electrical stimulation treatment, massage and TMJ correction (braces, mouth splints) in order to help with my headaches. I even had 2 spinal epidurals in my neck and several trigger point injections to reduce pain, which did not work. I’m sure some of these treatments have helped in some way, even just my own education, but I saw no reduction in headaches or in pain level. In fact, things just got worse. My normal life has been impaired depending on the medicine that I was taking. Without medicine, I was in the bed for three days straight wishing I would die! In the early years, I took Fiorinal, which took away the pain, but I could not drive (or see straight!) due to the drugging influence. As a result, I usually missed 1-2 days of work or weekend time. The uncertainty of the timing of the headaches was another frustration. It seemed like every vacation I went on, I had a migraine! Fiorinal eventually stopped working for me, and at the time, I would have to go to the headache clinic for a DHE shot. This would knock me out and I would have to impose on someone to come take me home. In more recent years, I have more headaches, which result in more “lost days” of just being at home on the couch while the medicines like Imitrex take effect. I came to see Dr. Marc on February 20, 2002. I had just experienced one of the most horrible years of my headache history. At the worst, I was having headaches of some kind around 10-12 days each month. I had also started having a disorientation and aura with the headaches, which I had never had before. I sensed something was wrong with my sugar, but couldn’t seem to get any help from my regular doctors. They just said to eat small meals throughout the day to balance my system. Also, during this time, I noticed that I didn’t have much of an appetite for food. Nothing seemed to satisfy my body. I would eat, but then not feel good – almost like the food wasn’t doing me any good. I began to pray that God would send me to a doctor that could help me. Word came to me from my mother’s chiropractor in Chattanooga about this doctor in Atlanta – and guess what? He was only 10 minutes from my house!! In Atlanta, that’s a blessing!! I have already started to see benefits. Dr. Marc immediately eliminated about 95% of my current diet and has challenged me to make other changes over the last 2 month. It has been a struggle, but the result is that I went for almost 4 weeks without a migraine!!! Although I have continued to have a few headaches right now, I can say that I am not having as many and the pain level is reducing as well. I don’t have to take as much prescription medicine as I was before. I am not having the disorientation or aura anymore either. In addition, I have an appetite again. I can tell that the food I eat is benefiting my body. Would I recommend this treatment to others? I would, and I have. Unfortunately, this kind of treatment is usually the last resort because we typically like the easy way out (i.e. take a pill and relieve the symptoms). But I have found that the approach of treating our bodies holistically, although harder and requiring more from us, will ultimately be the best approach to get to the root of the problem.”C.R.